The Gibson family, Edwin C. ’60, the late Rochelle Gibson Crum ’61, Bruce ’66, and Adrian (St. Thomas ’73) established the Edwin P. and Ruth A. Gibson Memorial Scholarship in remembrance of their parents who passed away in 2005. The Gibson’s initially donated $15,000 to establish the endowment. Mr. Gibson was a volunteer basketball coach at St. Joseph’s school in Alliance for over 25 years, mentoring many players who went on to play at Alliance, Canton Central Catholic and St. Thomas Aquinas. One of these young men was former Alliance High coach Ron Kuceyeski. Coach Kuceyeski remembered his former seventh grade coach as a man of quiet, but firm, discipline with his teams. “Over the years, Coach Gibson taught basketball calmly, much like a classroom teacher, rather than a ‘screamer type’,” Kuceyeski said. Some of that teaching approach must have been passed on to Coach Gibson’s oldest son, Edwin, who is an Emeritus Professor at Kent State University’s Department of Mathematical Sciences and the Distinguished Teacher Award winner in 1991. With a high regard for education, the Gibson family intends that this scholarship will help AHS graduates achieve higher education goals and dreams beyond high school. 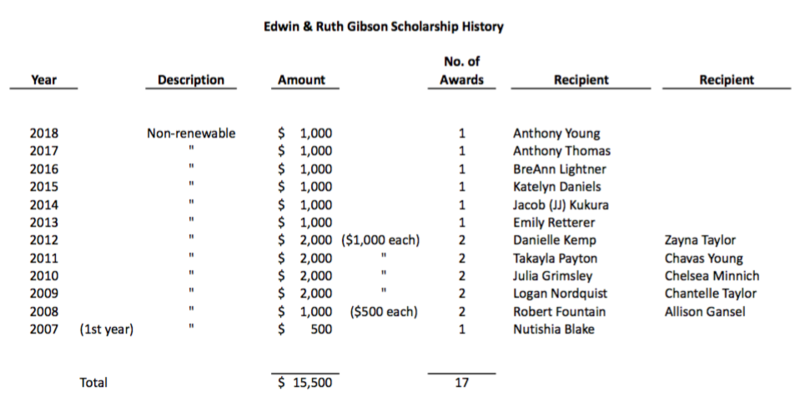 The Edwin P. and Ruth A. Gibson Scholarship is awarded to Alliance High School senior basketball players who have demonstrated the capability for advanced education by maintaining a high academic standing and by having satisfactory academic test scores. Recipients are selected by a committee established by the family.